We’re lagging behind everyone we know in decorating the home for Christmas. Two daughters are sharing photos of their multiple trees adored thousands of lights, themed tree ornaments, and rooms devoted to Dickens, Williamsburg, Disney…. so clearly I needed some inspiration this year get started. 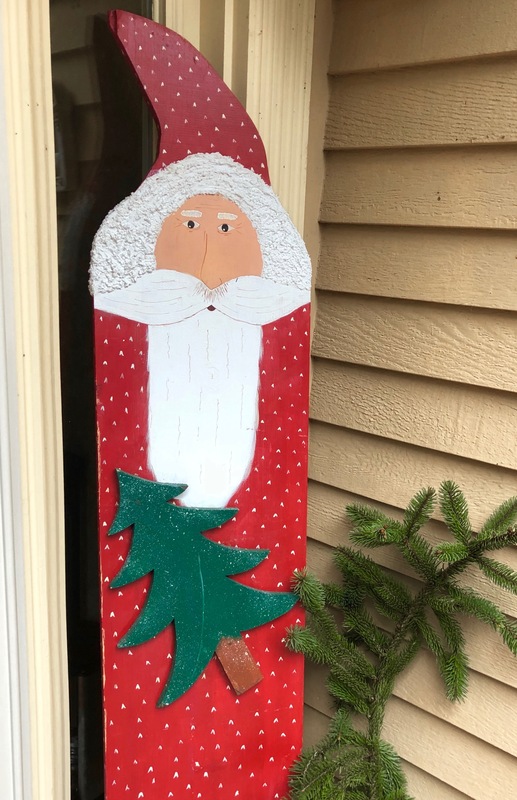 First things first: Santa came out of storage yesterday and, as he has for 30-some years, greets visitors at the front door. Churchill’s Gardens, just down the street, provided the perfect showcase for inspiration with their holiday greens, twigs, and berries for sale and a wonderland of Christmas in their showroom. Holiday music, themed trees, several Santas and reindeer were there to greet us in this North Pole atmosphere. mister gardener and I spent time absorbing the ambience, bought a ribbon and some southern magnolia leaves, and returned home to invite Christmas to our home. 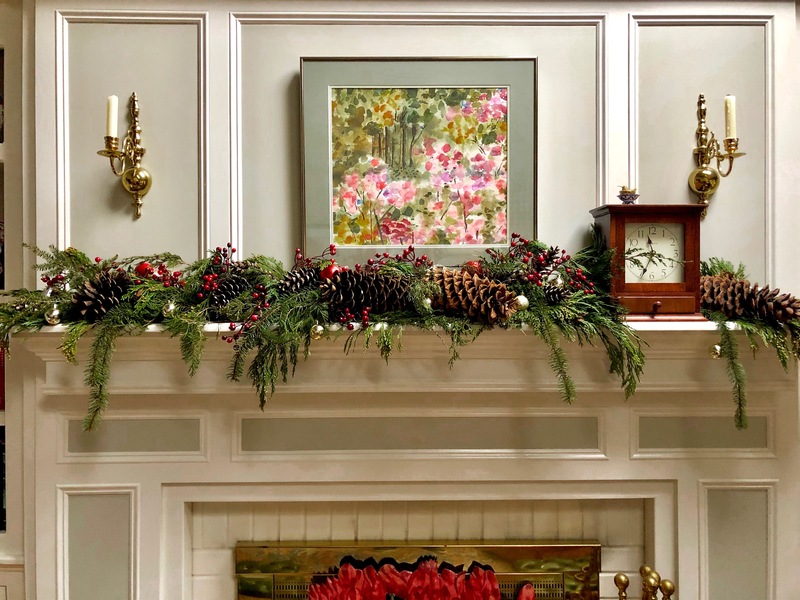 So far, something simple for the door…..
…..and our planter we filled with gathered greens, berries, twigs, and the southern magnolia, which greeted us this morning with the season’s first snow. I can’t think of anything better than a nice snowfall to inspire us for the Christmas atmosphere. Old Man Winter is quietly slipping into New Hampshire. On our morning outings we see more signs that he has a foot in the door. Vibrant colonies of the holly shrub winterberry (Ilex verticillata) dot the brown landscape in ditches and low lying areas. What a showstopper! 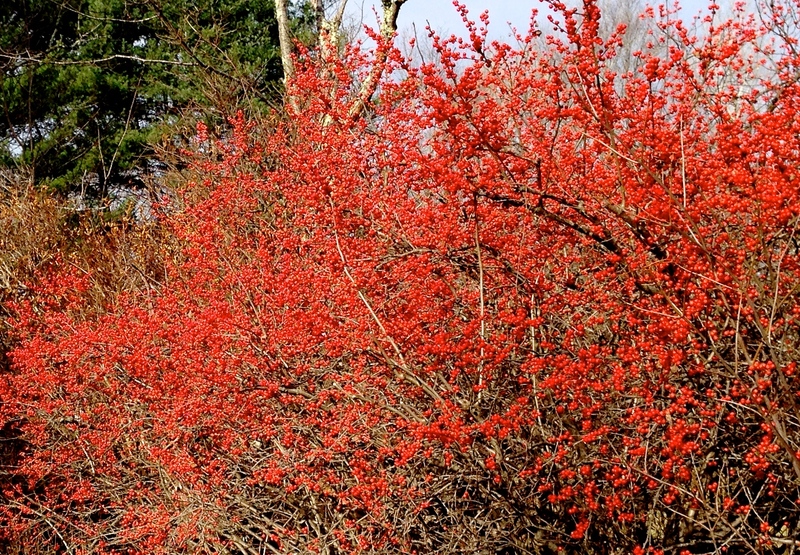 I read in the blog New Hampshire Garden Solutions, that due to low fat content, birds may not have these berries at the top of their menu in the winter. 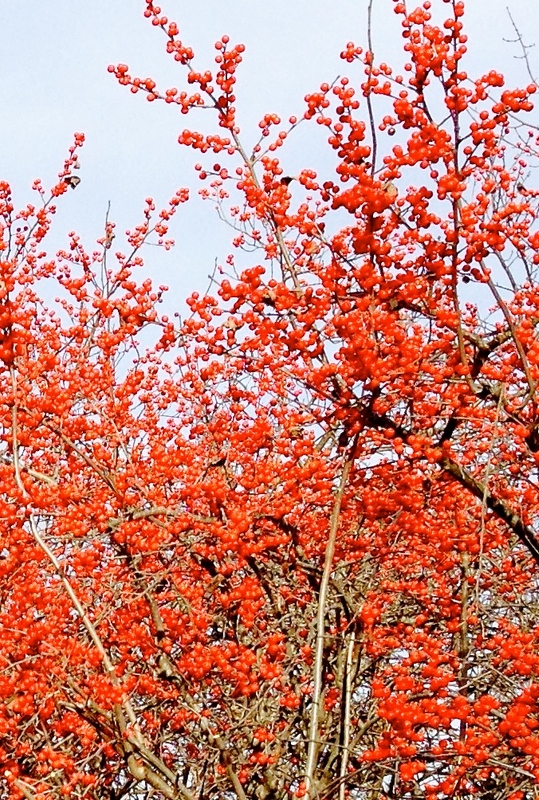 Therefore the berry laden branches are available for folks to cut for Christmas decorations. I like to purchase cultivar branches at nurseries so I can enjoy the native berries in their natural surroundings. 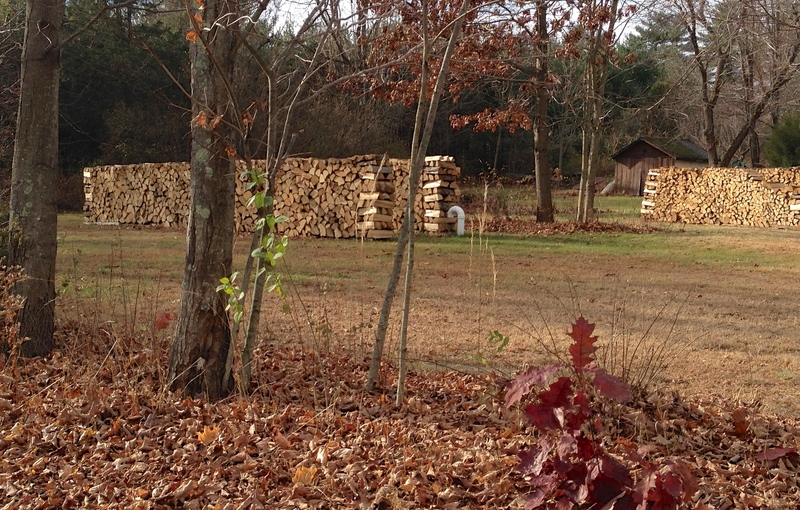 You don’t see cord wood like this in Tidewater Virginia, but homes around here are often heated with wood. I am still stopping to stare at sights like this! This family is ready for winter. 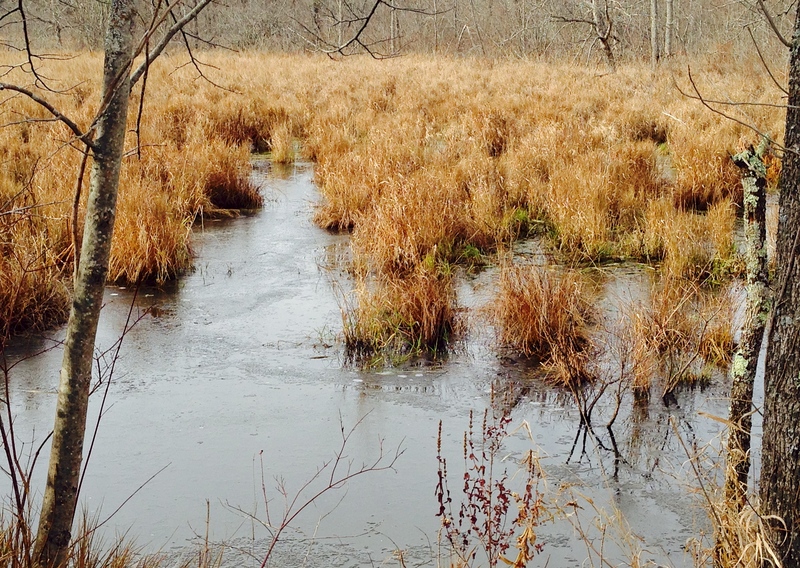 Most mornings finds thin ice covering low-lying area ponds and creeks. 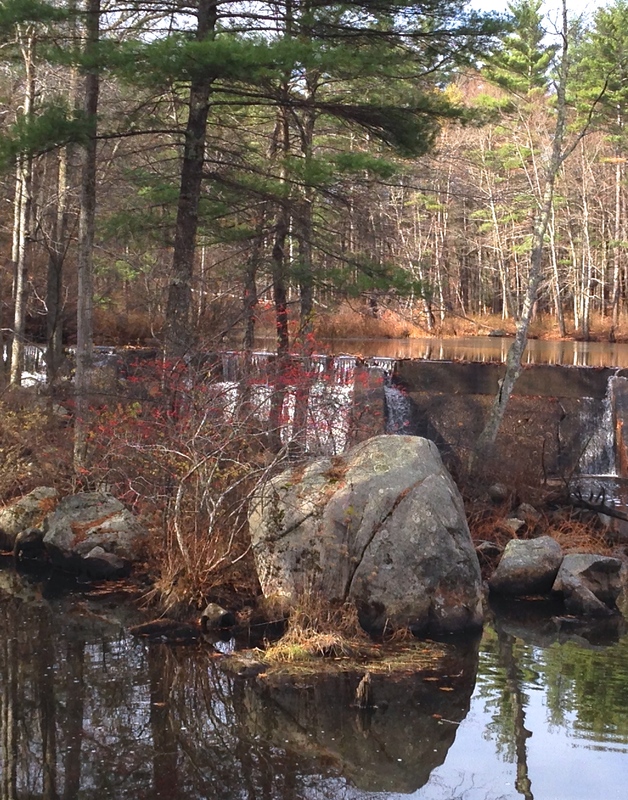 Running water falls from an icy ponds and leaves have fallen from deciduous trees allowing the evergreens and berries to take center stage this time of year. It is also common to see small flocks of Dark-eyed Juncos and White-throated Sparrows foraging beneath our feeders. These birds are likely migrating from Canada to warmer climates for the winter… although some stay here. Both are in the sparrow family, flock together and are known to produce hybrid offspring. Lastly, with the leaves gone from the mighty oaks and maples, a synchronized scene is taking place in every yard in Exeter. 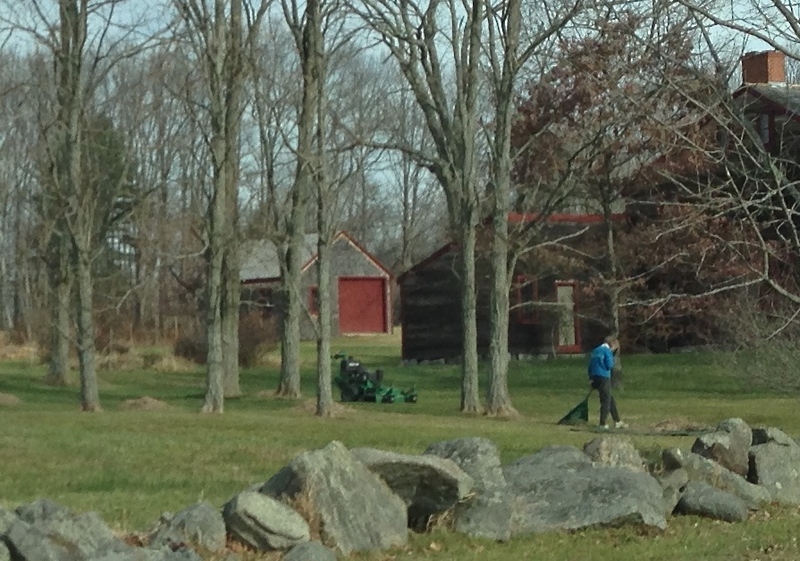 The last of the leaves are being blown, mowed, raked or bagged all over the area. Let’s hope that most end up in a nice compost. How GREEN!